St. Dominic's Varsity Dance Team: the Crusaderettes. 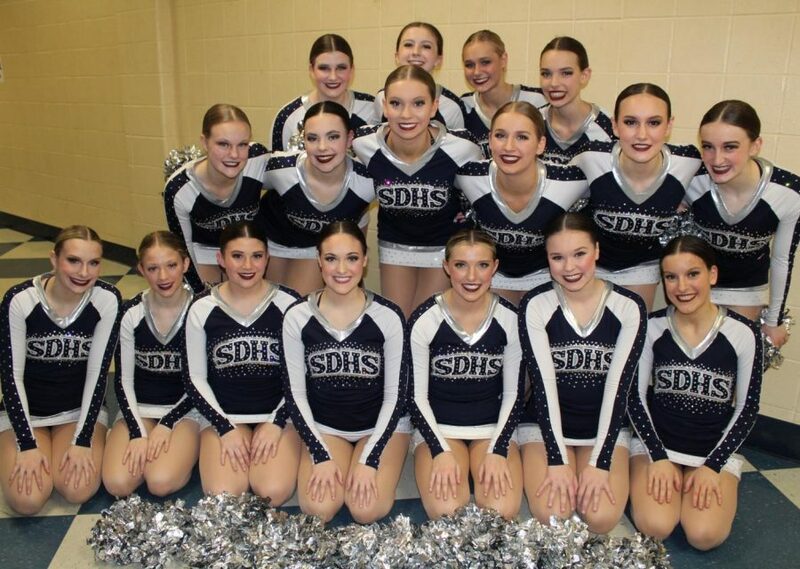 This past weekend, the St. Dominic dance team competed in the St. Charles Classic competition. The girls performed both a jazz routine and mix routine, placing first in jazz and second in mix. The week started off with plenty of hard work for the Crusaderettes. This was nothing new as they had been practicing hard all season, working Monday through Friday for three hours a day. Last week, the girls practiced especially hard to prepare for their competition. On Thursday, the girls were able to take a much-needed breather and participate in some team bonding before their big day. “We did really well at this competition last year, so many people had the motivation to get a great outcome this year,” senior Annesley Haring said. The girls arrived at 7:00 a.m. wearing their team outfits and thinking about the first and third place finishes they had in last year’s St. Charles Classic. Once there, they forgot about the past and focused on this year as they got into costume and started on their hair and makeup. “It has been awesome so far this season because we have done better in our competitions compared to years past,” Haring said. After each member was ready, the girls stretched and did their jazz routine twice before performing. With nerves high and excitement even higher, the girls hit the floor and performed a flawless routine. After finishing jazz, the team took an hour break to say hi to family and friends as well as to get lunch. At 1:10 p.m., the girls came back together to fix their hair and makeup and change into their second costumes. After all of the girls were ready, they stretched and practiced their whole routine. The team then made their way down to compete. After performing a great mix routine, the girls changed back into their team outfits and relaxed, awaiting the awards. At 6:00, it was finally time for the awards. The girls anxiously awaited the scores. It was finally announced that the Crusaderettes had placed first in jazz and second in mix. The girls and coaches alike were overjoyed that all of their hard work had paid off. “I just thought it was cool that even though all of us were pretty worn down from the long week and weather, we all pulled together as a team to leave our hard work out on the floor and getting to see Coach MK and Coach Brittney’s faces when we won first and second. We all just had fun the whole day together and we kept motivating each other, cheering each other on,” senior Katie Woltering said. We want to congratulate all of the girls on their hard work and big win last weekend and continue to wish them luck throughout the rest of their season and into state! Check out their first-place jazz routine here! Thanks,Darby!, for writing about the hours involved in success!